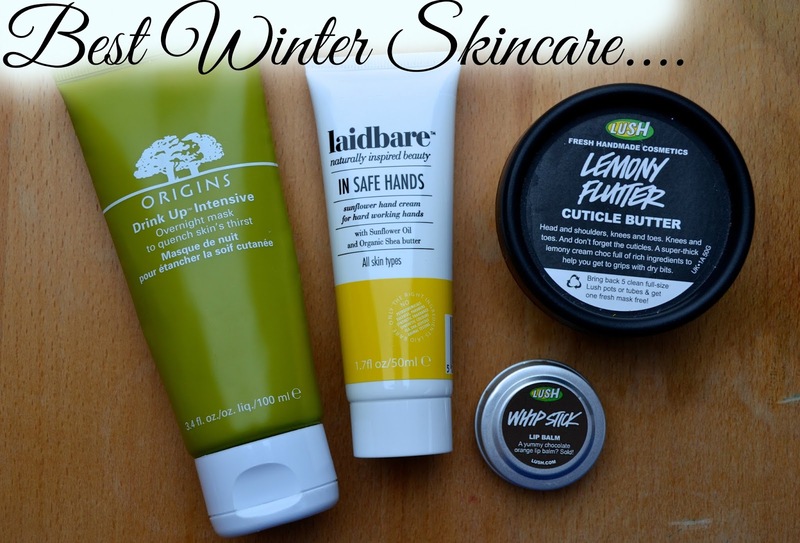 With Winter comes skin trouble but the cold has finally set in to the point where even my winter skincare isn’t cutting it. The wind is whipping round my face every time I open the door and the chill has crept into my little attic home where the radiators often fail. But here I have a couple products that may help, if you are struggling like me with dry painful skin. Origins Drink Me Up Intensive! I normally use this as an overnight mask once or twice a week, but in the winter it gets pulled out every day or every other day. I talked about this on my old blog twice here and I still love it. I slather this on, breathe the gorgeous apricot smell in deep and go to bed. When I wake up my skin is moisturized, soft and plumped up, ready for makeup. Perfection. You can get it from Boots here! Hand Cream, my favourite at the moment is Laidbare's 'In Safe Hands'*! Ah, our hands. They really get the brute of the winters strength and hand cream often lies forgotten at the bottom of my bag. But! My tip is to put them everywhere. Spread out your hand creams, depot if you don’t have a unnecessarily large collection like mine and leave them in handy places. On your desk, by your bed, by the sink, next to the kettle, anywhere you can think of, and apply every time you see them! Your hands will thank you for it. You can get Laidbare's offering here! A thick lipbalm, I recommend the Nuxe Reve De Miel or Lush's Whipstick. These are for overnight, a nice thick layer that has sunk in by morning and leaves you with soft lips ready for the days lip product, rather than dry cracking lips that don’t accept moisture. If you get in a good habit of applying lipbalm and hand cream before bed, it can actually help your sleep hygiene and routine, helpful come Christmas Eve! And both my recommendations smell like Chocolate Orange. Yum. You can pick up Nuxe here and Lush's offering here! The best cuticle balm ever. Thick, lemon sherbet scented and you can use it on your elbow and knees and any dry spots that need major moisture as well. I've even been known to use a little on my forehead and nose where I get really dry. It is a godsend. I can't say enough great things about it. You can get this from Lush here! I know it’s hard when the outside is cold, you don’t feel like guzzling down water like you did in the summer but you still need your 8 glasses a day. Personally I like to sit at my desk in the morning with a few cups of tea, then in the afternoon I switch to green tea, all the while carrying around a bottle of just plain tap water. But there’s something so comforting about tea in Winter that I just can’t explain. Either way- Drink something! * This was received at the Look Fantastic Mid-Summer Meet. I am not obliged to show it on my blog and I have since bought two more tubes with my own money because it's damn good hand cream.